Town Criers were once a New England tradition. Walking the streets they verbally spread the news and in tourist communities such as Provincetown on Cape Cod, they were often employed by the Chamber of Commerce to promote commerce. Usually the image of a New England Town Crier is a plump man dressed in Pilgrim style garb. The Town Crier in the black and white postcard printed in Germany, shown above, carried the bell and the broadside, but is certainly not dressed like a pilgrim. Through Provincetown’s history there have been many different Town Criers, and they are documented in antique post cards. 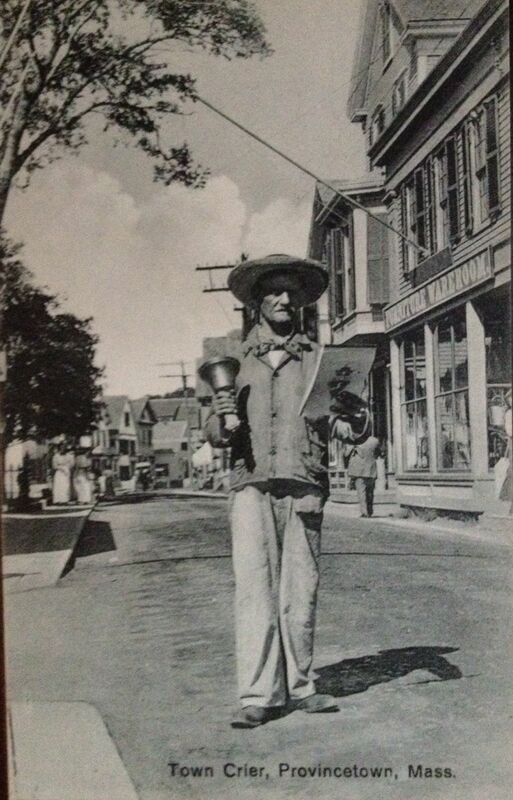 The last Town Crier for Provincetown, Gene Poyant, walked the streets in the early 1980’s and died in 1998. A Town Crier figures into the plot of the novel Remaining in Provincetown in more than one way, just as there are a variety of Town Criers. We’ll be sharing some more pictures of Town Criers from the past in the weeks to come.